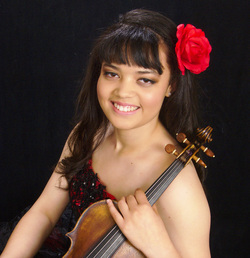 Annelle Kazumi Gregory began studying violin at an early age and currently studies under Michael and Irina Tseitlin at the California Institute of Music. She is a gold medalist of the 2012 National NAACP ACT-SO competition and a laureate of the 2013 National Sphinx Competition. In 2012, as part of a national tour, Annelle performed at Carnegie Hall as a member of the Sphinx Virtuosi, a 20-piece string ensemble. Annelle has won 1st place in the 2013 La Jolla Symphony Young Artist Competition, 2012 National NAACP ACT-SO Competition, 2012 & 2010 San Diego ASTA Competitions, 2012 Long Beach Mozart Festival Concerto Competition, 2012 Jester Hairston Scholarship Competition, 2012 NANM Georgia Laster Branch Scholarship Competition, 2012 Bellflower Symphony Concerto Competition, 2012 Los Angeles MTAC-VOCE Competition, 2012 MTAC Concerto Competition, 2011 Torrance Symphony Young Artists Concerto Competition, 2011 H. B. Goodlin Scholarship Competition, and the 2011 & 2010 San Diego MTAC-VOCE competitions, among others. In 2012, Annelle was the concertmaster and featured soloist for the CIM International Festival Orchestra at Weikersheim Castle in Germany. She has performed with the Torrance Symphony, Bellflower Symphony, and Long Beach Mozart Festival Orchestra and will be performing with the La Jolla Symphony, Southeast Symphony, and San Diego Symphony in their upcoming seasons. She was Concertmaster of the San Diego Civic Youth Orchestra from 2009-2011. Annelle has been featured on Detroit Public Television, KUSC Classical Radio, and San Diego’s classical radio station, 104.9 FM.